Power supplier to two of America’s major cities transforms culture and thrives during change. This power supplier to two of America’s major cities had already experienced the National Regulatory Commission (NRC) shutdown of one of its three nuclear facilities, undergone a massive reorganization and survived a huge workforce reduction. Now it faced deregulation. The company needed a method for meeting the imminent requirements of higher quality, competitiveness and customer satisfaction. The management team chose Precision Leadership (PL) as the proactive method for correcting past mistakes and facing future challenges. When the NRC shut down one of its nuclear power facilities, citing mismanagement and industry infractions, this power supplier with 10,000 employees performed a root-cause analysis. The analysis showed the company’s weaknesses were primarily those of poor employee retention, lack of accountability and failure to shape and motivate employee performance. At the same time, a rate case decision forced the utility to reduce cost and increase efficiency. 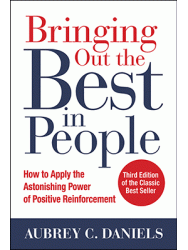 The management team searched for a method to measure performance and to inspire employees to improve their own work behaviors as well as work processes. After visiting several facilities that used PL, the team chose that behavior-based process as the engine for their multifaceted new improvement efforts. After training a core team in Precision Leadership (PL) methods, the facility began training 935 management and frontline teams in the technology. The organization quickly benefited from the results of 500+ active performance pinpoints in the areas of cross-training, turnaround time on management and budget reports, nuclear facility inspection, maintenance, internal and external customer service, quality, policy and procedure development, completion and implementation of business plans, billing, meter reading and productivity. Management soon realized that it had neglected a huge resource in its people. For example, by asking for operator input regarding a purchasing decision, the transportation department saved $220,000 in direct costs and $800,000 in equipment life-cycle costs. This giant utility that had once faced over $250 million in fiscal consequences plus $1.3 million in fines for its nuclear facility failure, now used PL to reopen and revitalize the plant, receiving comments from the NRC that the revised management methods had set a new and admirable standard for the industry. Completed high quality substation with less manpower, within less time and $1million under budget!